Are you tracking animals which stay parts of the year inactive? The hibernation sensor is at least a part of the mortality counter. If the function “Enable Hibernation Sensor” is checked, then the mortality counter will be used for hibernation mode. In hibernation mode, no attempts will be made to get a GPS fix. This will extend the operating lifetime of the GPS collar if the animal goes into hibernation, f.ex. in a den. Wakeup is the leavel of activity, which stops the hibernation mode and brings the collar back into normal operation. That means, if you deploy a GPS collar on a bear without hibernation mode, the collar try to take fixes al the time, the bear is in the den. That take a considerable amount of batttery power, because no position can be taken by the GPS engine. The hibernation mode is an user configurable feature in the GPS PLUS Software. Are you tracking bears with a GPS collar? 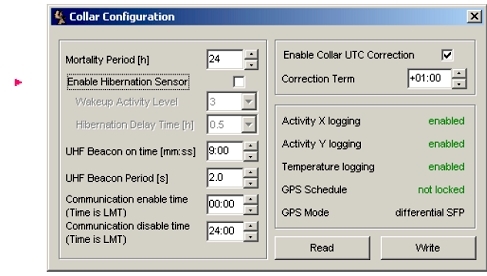 If the hibernation mode of a mortality sensor is enabled in a GPS collar, the GPS engine is triggered in an off mode if the bear is going into the den. Over the months of hibernation, the GPS collar make no attempts to take a position and battery powerser is safed . After the bear shows the first activity afer leaving the den in spring, the collar is triggered to take fix positions according the regular GPS schedule again.